Munich is the capital of Bavaria and the third most populated city in Germany. It's a popular tourist destination for its impressive architecture, cosmopolitan vibe, and annual Oktoberfest. Munich has a lot to offer all types of travelers and it's a fun city to explore. Whether you're a student traveling on a budget, or a long term backpacker who wants to meet other travelers, hostels offer a social and affordable accommodation option in a central part of the city. 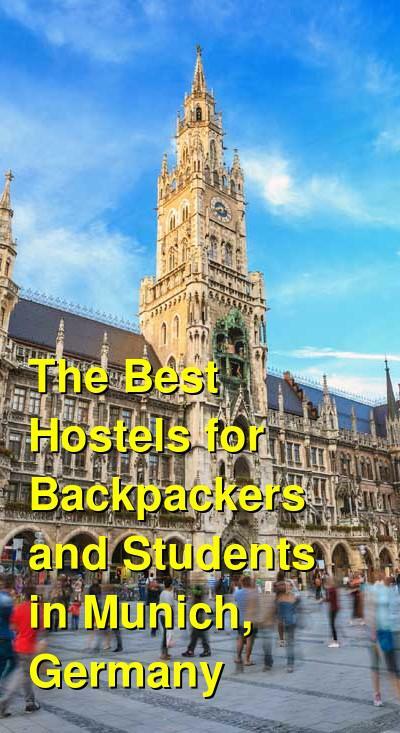 There are a variety of great hostel options in Munich for young travelers, students, and backpackers who are hoping to save a few bucks. How much do hostels in Munich cost? A fun hostel for backpackers, students, and young travellers. Wombats City Hostel is one of the most popular hostels in Munich. It has a friendly atmosphere and a convenient location near the train station and public transportation. It's about a five minute walk from Old Town and is a short walk from Oktoberfest. The hostel has some great amenities for guests including a good security system, comfortable beds, and wi-fi throughout the facilities. You can enjoy a free welcome drink when you arrive and a delicious all you can eat buffet in the morning (for an additional fee). If you're on a tight budget, the buffet is a great way to fill up so that you only need a light lunch. This is a hostel that's designed specifically for backpackers. Whether you're a student studying abroad or you're enjoying a gap year, this is a fun and affordable place to have a good time and meet other travelers. The hostel has twin and double private rooms available as well as six, eight, and ten bed dorms. Whatever your style or budget, there is likely a room that meets your needs. A good hostel for backpackers, independent travellers, and students. Euro Youth Hostel is another favorite place to stay for backpackers, students, and budget travelers to Munich. It's recommended in many of the most popular guidebooks so they fill up quick and reservations are a must. The hostel has a fun and social environment. There's a bar that has happy hour every day. The staff also organize a number of different activities for guests including walking tours and game nights. Other amenities available include free wi-fi throughout the facilities, free luggage storage, and all kinds of travel information. The hostel is located about 100 meters from the main train station. 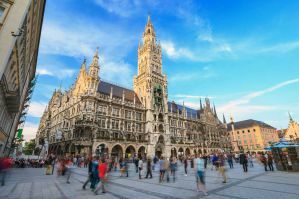 It's also just a short walk from many of Munich's top sights and is near public transportation that makes it easy to access most parts of the city. The hostel is housed in a historic building that has a lot of character. There are 58 rooms in total and 200 beds. Private rooms include singles, doubles, and twins. Both large and small dorm rooms are available as well. If you want the social setting of staying in a dorm there are rooms that sleep three, four, five, six, or twelve people. This is a fun and friendly place to stay with a great staff that can answer any questions you might have. If you're looking to make a few new friends, then Euro Youth Hostel is a good option. A good hostel for backpackers, independent travellers, and small groups of friends. Meininger Munich City Center is another favorite place to stay for backpackers and budget travelers. It's located in the middle of the city very close to the location for Oktoberfest and it's about fifteen minutes away from central station and the city center. It's a fun place to stay that has a lively bar, a small kitchen, a game room, pool table, and much more. There's a social environment and it's really easy to meet other guests here. The hostel has all of the standard amenities available including an all you can eat buffet breakfast (for a fee), a travel desk, bicycle rental, and luggage lockers for guests staying in dorms. The hostel has a wide variety of private room types to choose from. The sizes range from singles to six bed rooms with everything in between. Dorms sleep either six or twelve people.